28 June 2018, Accra, Ghana. Women sell tomatoes at Agbogbloshie market. Agbogbloshie neighbourhood is internationally well known as its has one of the biggest electronic waste in the world. There will be “no sustainable future without eradicating poverty and hunger,” the United Nations agriculture agency chief spelled out on Monday, launching the Food and Agriculture Organization’s (FAO) latest flagship publication, on the world’s Agricultural Commodity Markets. “As populations rise, urbanization increases and incomes grow, the agricultural sector will be under mounting pressure to meet the demand for safe and nutritious food,” Mr. da Silva explained. 04 September 2017, Skopje, Macedonia - A man selling fresh produce in a green market in Skopje. 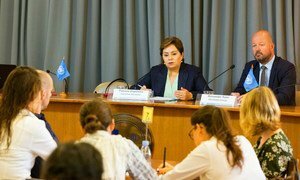 New UN-backed commitments to take action against the damaging effects of climate change, could result in $26 trillion in economic benefits worldwide, and help create 65 million new “low-carbon jobs” by 2030 – the deadline for the realization of the Sustainable Development Goals (SDGs).